Kinshasa was calm and many campaign posters had already been torn down. At polling stations, election officials were still working, putting sheet results of each of their centers into large envelopes, waiting for other officials to pick them up. This official said he had not slept in more than 48 hours. Many arrived late Saturday, expecting that disruptions would prevent them from easily arriving at their polling center. Another official said their working conditions were inhuman. He says the international community paid $460 million for this vote, but that election officials got just $35. He says they have not eaten since they arrived. 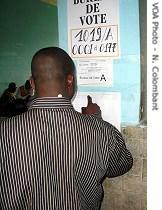 Complaints were the same at each polling center. But election officials also said they were proud of the work they were doing. Results in Kinshasa indicate former Uganda-backed rebel leader Jean-Pierre Bemba is ahead in the capital, which accounts for about one-eighth of all national votes. Trailing him in Kinshasa is President Joseph Kabila, who appears to have done well in the former Rwanda controlled city of Goma. There were 30 other candidates, but none seems to have a chance to make it to a second round. Congolese are hoping to get a clearer idea of results in the coming days through local media, but election officials say only their results, which will be made available at the end of August, will be reliable. If a second round is needed, election officials say it will take place October 29. A one-round legislative election also took place Sunday. This election official said it was impossible to give any indication for that vote, with few candidates getting good scores. 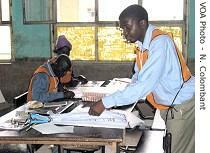 More than 9,000 candidates vied for 500 seats. On voting day in Kinshasa, there were allegations that members of the presidential guard tried to vote, despite being banned from doing so, and that members of Mr. Kabila's entourage handed out dollars to influence votes. His campaign team denied this took place. The only major trouble spot appears to have been in and around the central mining town of Mbuji-Mayi where anti-vote militants destroyed several voting centers. Militants of a major opposition leader, Etienne Tshisekedi, are boycotting the process, saying preparations for the vote were inadequate. Election officials reopened about 170 polling areas for voting to resume in an area that is a Tshisekedi stronghold, under heavy police protection. Officials from the world's largest U.N. peacekeeping mission called the vote a logistical miracle. International observers are expected to give an initial assessment Tuesday.